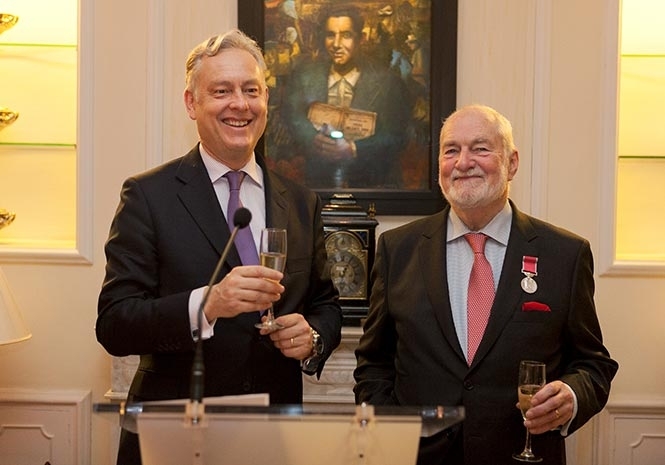 JOHN KIDDELL, a former accountant and resident of Madrid, was last night (Tuesday) presented with a British Empire Medal for his services to the British community in the city by British Ambassador Simon Manley, at an event held in his Residence. Mr Kiddell, originally from London, moved to Spain in the 1960s, where, initially, he worked for the then Ernst Whinney, later Ernst and Young. Over five decades he has volunteered for a whole range of British groups and charities in Madrid, including offering his accounting skills for free, to groups as diverse as the British Chamber of Commerce, St George’s Anglican Church, the British Ladies Association, the British Benevolent Fund, and the British Cemetery Committee in Madrid. Simon Manley said “I never fail to be impressed by the contribution that so many British nationals make to their communities across Spain, but John Kiddell stands out as one of a kind for his sustained contribution to so many groups in Madrid over so many decades, always in a humble and understated manner.